Blake Pyron is the first business owner in the State of Texas with Down Syndrome. And now he is the numero uno business in Denton County. 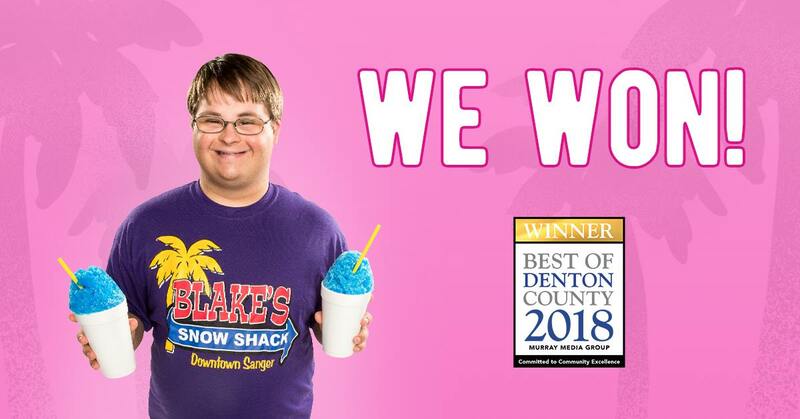 Blake’s Snow Shack was recently voted to the prestigious 2018 “Best of Denton County” list. A record 16 million votes were cast, and Blake’s world famous snow cones came out on top for the county’s “Best Frozen Dessert” in the Restaurant/Food category. Blake Nation came through in a big way, helping him top the previous two-time winner and a regional brand with 124 locations in 7 states. Rumor has it that Hawkeye from KSCS, Bill Bowen from 99.5 The Wolf and country musicians Josh Abbot, Pat Green and the entire Eli Young Band cast their support for the Sanger native. Sweet, sweet victory.